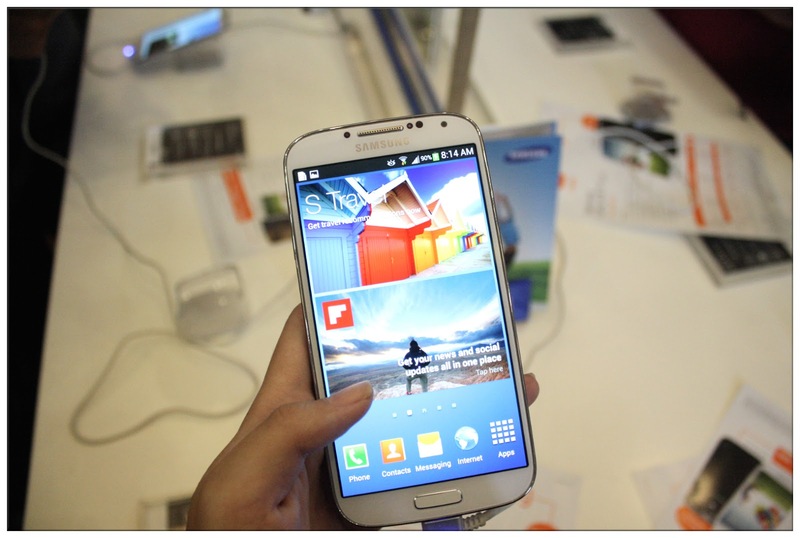 You know it is here - Samsung Galaxy S4, is now available in Malaysia!!! I am definitely not exaggerating if I say that Samsung Galaxy S4 is the smartphone of the year, because you know what, it's totally sold out on its first day of launch! Crazy!!!! The shopping malls around Bukit Bintang especially Plaza Low Yat and Berjaya Times Square had a fun party launching the Galaxy S4 and there are so many performances to enjoy by shoppers. Flash mob with PSY's latest hit - Gentleman. 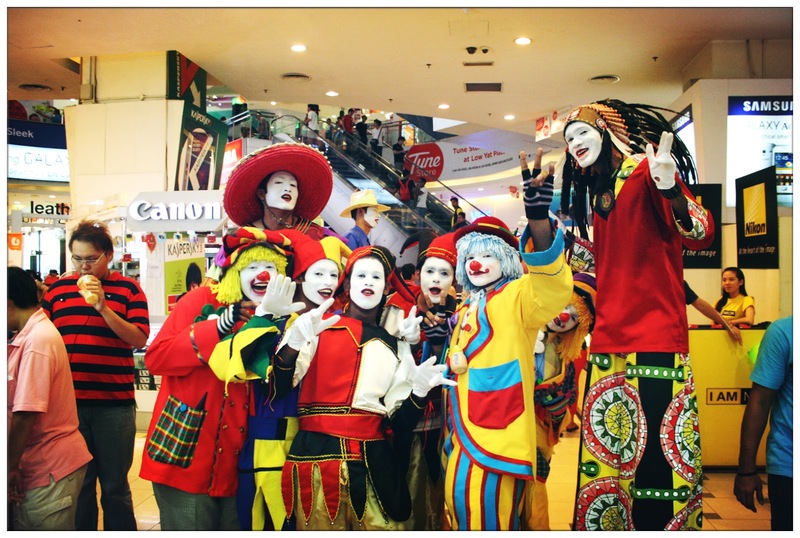 There are clowns, jesters, mimers and lotsa lotsa balloons and confettis. Liyana Jasmay and Awal Ashaari as the local celebrities who officiated the launch of Samsung Galaxy S4 alongside with all the big shots from Samsung Malaysia. Never ending queue of gadget lovers to get the first touch of the awesome phone. I am sure that many of you would like to know what are the new features of S4, many can't wait for their next batch of stock already. Samsung Galaxy S4, available in White Frost and Black Mist, according to some news source, White Frost is now price at RM2450 because the phone is so pretty in white can! If for me to choose I'll definitely go for white too. Finally my turn to test the demo unit. 5-inch FULL HD Super AMOLED (1080 x 1920 pixels) display, the colour of images portrayed are so vivid and lively, so much different from my current Galaxy S3. It is such an enjoyable thing to watch videos and images using the S4 because of its superb display quality. I am a person who look into display qualities a lot because a photo has so many things to say, if the display isn't clear or vivid enough, the expression of images wouldn't be as lively as it should be don't you think so? S4 is definitely gave me an awesome viewing experience. New feature - Dual Shot! Another feature that wins my heart is its 13 megapixel autofocus camera with LED flash and HDR recording plus new features which are the dual shot and drama shot. The camera was fast, detail and the photos are so clear. 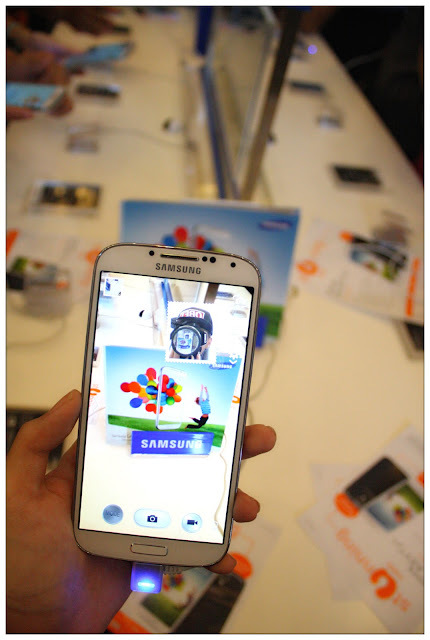 Samsung Galaxy S4's front camera will be 2 megapixels 1080p and also 30 frame-per-second video recording too. Photos that took by its front camera kinda shocked me because the photos came out so clear! This is a much needed awesome-possum phone for girls who likes to take photos and of course - selca all the way!!! Samsung Galaxy S4 manage to cram all the awesome features into a slimmer device, kudos to that. When I hold the phone I feel it fits just right in my palm, definitely comfortable to use for a long period of time. Rounded edge, same height as the previous S3, but thinner and lighter. I really like the feeling of holding it in my hand. lol. S4, stands for Super, not simple, got these smart features in hand that will be the lead in the smartphone industry. Air View, Air Gesture, Smart Pause and Smart Scroll are some features that are new to me because my phone doesn't have these features. These are called as magical Air and Gesture technology which brings a phone scrolling and looking to a whole new level. Although Note 2 already has the Air View trick, but it requires the S Pen to do the thing, but with S4 improved technology, there's no need of S Pen to complete the task, making everything finger-friendly. Air view means you hover over an image, or texts, or maybe emails for more details shown. A magnifying effect on the image, previewing emails or even, a details of agenda in the calendars can be shown with just a simple hover-over gesture. Other than that, Air Gesture is something I love, it makes flipping through photos, skip songs or even accept calls easier - with just a simple hand wave over the screen without exactly touching it. Definitely a MUST for drivers. Where Smart Pause is an eye-tracking feature that tracks the movement of your eyes. If you're watching a video and suddenly something distract you, the video will pause automatically and resume playing once you set eye on the phone. Isn't it awesome? Definitely gonna keep my eyes and hand gestures busy if I ever get one Galaxy S4. Colorful casing uniquely designed for Galaxy S4. There are so many people waiting to try out the phone, I still haven't done experience it yet. 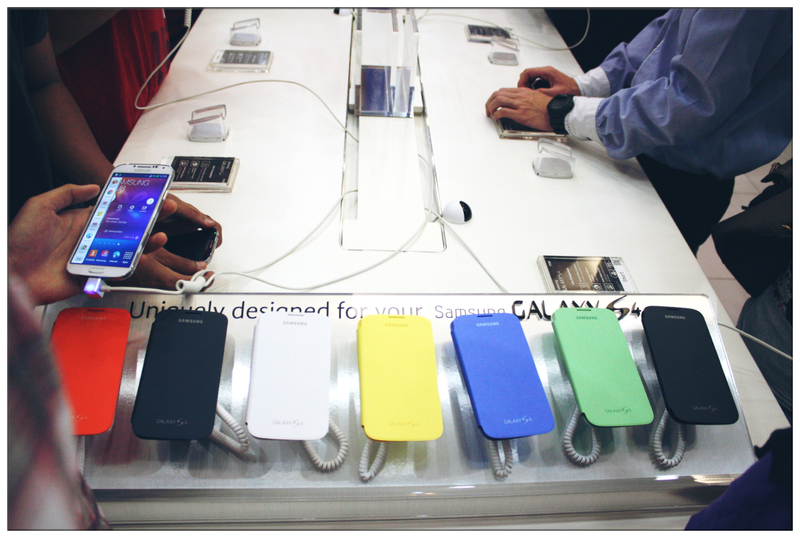 Will definitely stop by Samsung Outlets to try the phone longer. I saw a lot of Telco companies are offering awesome deals for Samsung Galaxy S4, or you can visit the Samsung outlet near you to find out more. 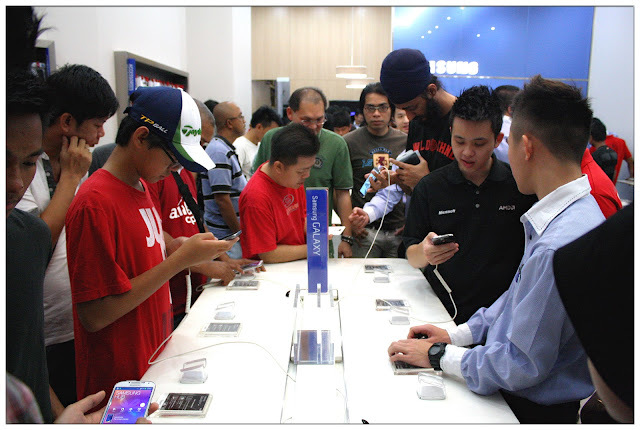 Currently Plaza Low Yat's Samsung Outlet already out of stock, the next batch of stock will only arrive next week either Thursday or Friday (2nd or 3rd May 2013).